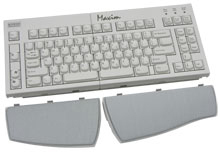 The Maxim adjustable keyboard offers a more flexible, more comfortable design than regular keyboards. Accommodating a wide range of user preferences, it is simply the best adjustable keyboard at any price! Compatible with virtually any PC system.Click here for the results of a keyforce comparison study conducted by Keytronic's Reliability Laboratory. Ideal for situations where a cost-effective ergonomic solution is required with a minimal adaptation period. 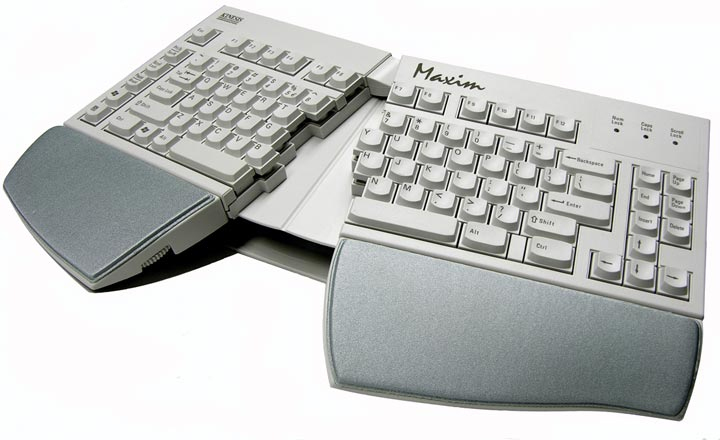 It is especially effective for a multi-user environment as this keyboard can be adjusted to be a conventional or 'natural' style keyboard with or without a palm support. If you have a fixed split ('natural' or 'wave') style keyboard and want to reduce the reach for the mouse, this is the ideal solution. 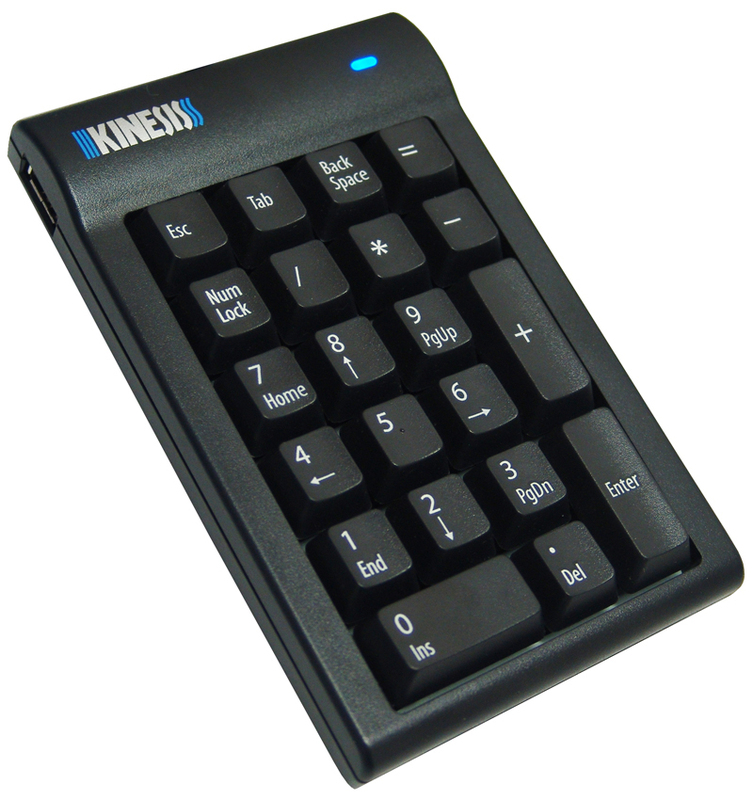 If you are looking for a left handed version of a fixed split keyboard, add on the Kinesis Low Force Tactile Numeric Keypad (AC210USB - see later on this page). 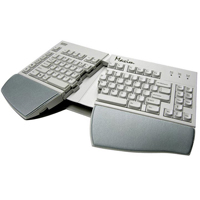 Variable split: Much more flexible than the 'natural' style keyboards; no adaptation required. Select any opening between 0° and 30°, a wider range than any fixed-split keyboards. Adjustable lateral tilt: Select between 0°, 8°, or 14°... And easy to adjust! This allows users to minimize forearm muscle tension without the pitfalls of excessive tilt. Compact design: Narrower than 'natural' style keyboards while maintaining full-size key spacing, minimizing adaptation time. In addition, the reduced footprint means your mouse is closer than with conventional keyboards. Instant, reproducible setup: Of both split and tenting features. Removable palm supports: Comfortably padded to take the weight off your shoulders, relieving neck and shoulder pain. Quiet, tactile, light touch switches: Keyswitches provide a soft touch, reducing strain on your fingers while providing positive feedback. Full n-key rollover supports maximum typing speed and multi-key combinations. Flexibility in configuration: User 1 needs a conventional keyboard without a palm support, no problem. User 2 wants a 'natural' style left handed keyboard, add the AC210USB numeric keypad, put it on the left, tent the keyboard to 8° and adjust the splay, and you have a left handed 'natural' style keyboard. User 3 wants to tent it higher and remove the palm supports... all options are available with the Maxim. Width: 15.1" (38.4 cm) with 0 opening angle selected. Maximum width is 19.0" (48.3 cm) when fully separated. Height: 1" (2.5 cm) with 0 lateral tilt selected. Maximum required clearance is 3.5" (8.9 cm) if fully elevated. Depth (front-to-back): 6.5" (16.5 cm) with palm supports removed. Depth is 10.3" (26.2 cm) with palm supports attached.